It takes me awhile to get excited about early fall because it means my favorite season is almost ready to hibernate but it is not quite sweater, apple cider, and cute boot season. It is a little too early to go Halloween crazy with the decorating. I’m not sure what we’ll do for Halloween. Husband and I aren’t in the mood for ghosts and skeletons this year. I guess we should go with fall harvest porch decorations. Leaves, pumpkins, corn stalks, and country rustic autumn décor is very eco and can stay up until Thanksgiving. I appreciate that style at other people’s homes but it is not something I want to stare at for so long in my own home. I want to hang onto to bright colors and whimsy for as long as I can until the snow flies. 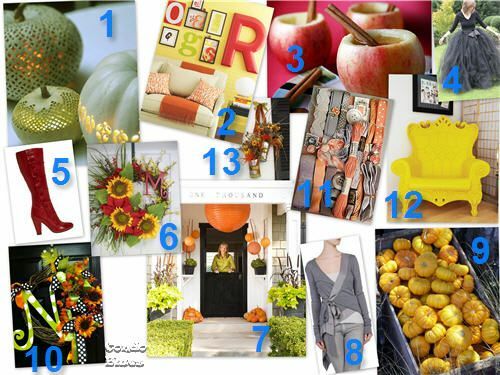 I created a nontraditional modern whimsy autumn porch mood board to motivate me to think fall and spark some ideas for our porch. What inspires your fall decorating? What a great board, so many inspirations. Thank you for sharing at the Thursday Favorite Things hop. Your participation helps make it a success.I'm sorry I am slow to visit this week as I am fighting a nasty head cold and my time on the computer has been limited.Wishing you a beautiful day .